Functions are text items you can add to your templates that will dynamically change for each print job. Choose a name for your function. We suggest you name your functions like we did (fxNAME) so they are easy to spot on your templates. Choose a description that would make sense to your staff. If yes to prompt, users will be prompted to select the initial value at print time. NOTE - The rest of the fields change depending on the Type selected above. The list of items to cycle through at print time. Choose Numeric or Date. For Numeric you will select a start number and a number to increment by. 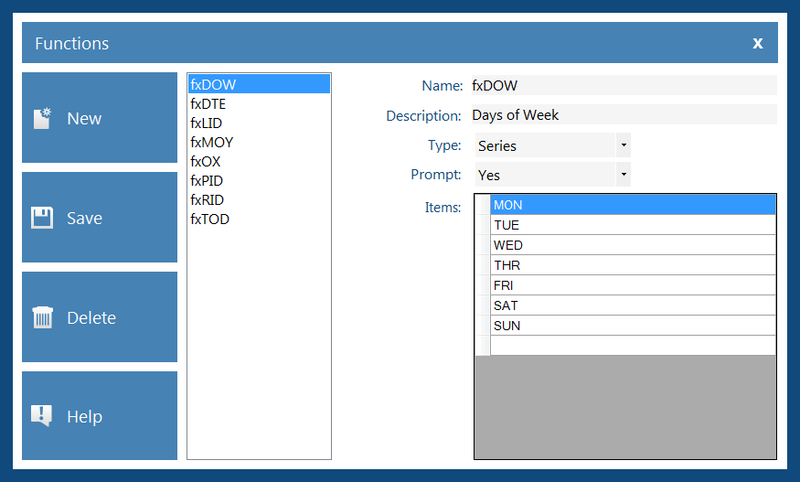 For Date you will select how to increment and a format for the date. Choose Alpha, Numeric or Alpha-Numeric for each digit you want in your random item.